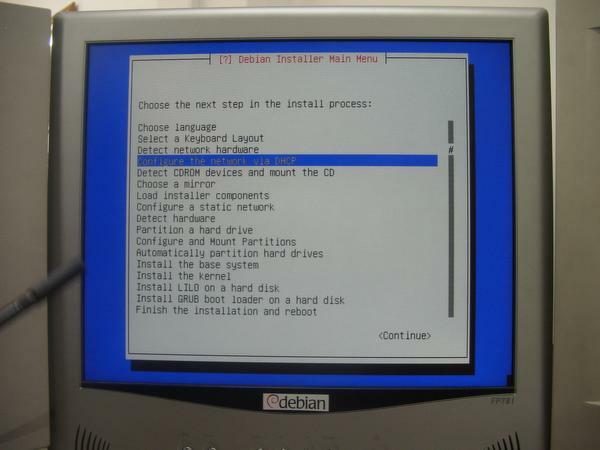 Slashdot has a link to a preview of Debian’s next-generation installer. Let’s see what amazing new interface and strides in usability the debian project has made since their last stable release in December 2002! To be fair they are working on a gtk version: “The developers can stick almost any front-end on it they like … , and if you really wanted to you could build a front-end using anything from a Braille device to Macromedia Flash. … but for now it’s text.” But, for now, it’s text. Yes, from the open source community who brought you “let’s never ever make a stable release so people have to use the ‘unstable’ version just to get anything done” comes: the installer that could be written in Flash and Braille but for now it’s text!!! This is what happens when you focus on stupid nerdy goals like “let’s make an installer that could have any front end” instead of “let’s have a graphics frontend and text just in case and make it work.” Next you’ll see a selection option at the front screen for next-generation debian installer in GTK or QT, because you know it would totally ruin my day if I had to install a distribution in anything other than my preferred toolkit.